Listener Steve Hall posted an exhaustive commentary on his perfect sketching setup in the comment section of episode 22. With his permission, we've reposted it here for good measure so more people can read it. It's worth its weight in gold. It's probably a good idea to listen to the episode first to understand why he felt compelled to tell us about his setup because we totally geeked-out on our favorite tools for sketching. At the end of the episode we asked what your favorite tools are that you use. So thanks to Steve for sharing. We've also added links so you can check out his tools for yourself. Great conversation! Nobody is "good" or "bad" at sketching, you have either practiced a lot or not much. Sketching is a means to exploring design, although they can also be beautiful by themselves. I used to try and segment work from play, and notes from sketches. No more, I now put everything in one place in serial order. It makes a great reference that I always have with me. I don't know how many times I've referred to field drawings, meeting minutes or a design exploration in a meeting or conversation and been glad it was all together. Before resolving to do this, most of the sketches and notes I created on napkins and other found paper were regrettably lost to the ages. I've been sketching in some form since the 1970s with a lot of experimentation along the way. It continued to refine up to five years ago when I discovered the final key to my "sketching rig." I'll share my specifications in case it helps anyone else. Opposing face sketching on this half-size notebook (despite Moleskine calling it "Large") presents a Letter size sketching surface. That's large enough for plenty of exploration while still keeping the notebook small to carry in any situation. But what about the binding down the middle? The Sketchbook binds adjacent pages so that there is only a tiny seam down the middle. No matter if it is the first page or the last, opposing pages are almost perfectly flat and present little visual or textural barrier between the two faces. Acid-free paper keeps pages fresh for decades, even centuries (with the right ink). Corners are very slightly rounded so there are no dog ears. Each book has a bookmark and a separate elastic closure band on the edge to keep it from coming open in transit. This is ideal to help keep loose items inside, too. (For fun, I keep four-leaf clovers I find at the page current when found, and also keep a few business cards loose inside the back cover for quick retrieval.) I sometimes use the elastic band as a bookmark so I can quickly open and close the book to the current page. Then the bookmark can be for some important page prior. There is also a pocket in the back for holding additional flat items in which I simply keep a few more business cards. The binder is black. I use a silver permanent marker to write the year of completion on the binding so I can reach for the right one on a shelf for reference. Make sure you get the "Sketchbook" model. I mistakenly purchased the more common green-wrapped "Notebook" at an office store and the pages are only half as thick and bleed. They don't lie as flat either although the paper is a tad whiter. The only improvement I would ever want is maybe a page color that is more white. The pale cream color looks nostalgic and doesn't bother me, but I'd prefer true white if I could have it. Forget the fancy gold nib, these are terrific pens that are super cheap and refillable. Hero has been made in China for decades and have an arrow-shaped clip similar to another popular pen manufacturer. You can find packs of 10 on Ebay for $14.50 in three colors. The best part is that you don't care if you loose it, can have extra sitting around, and don't worry about anybody else using it. The friction on the paper is not as silky smooth as a gold nib, but smooth nonetheless. I like a little friction like a pencil. In combination with the smooth Moleskine Sketchbook paper, I think it is a great balance. These pens are bullet proof. I've dropped them on the nib with no effect. They allow great flow of ink for blobby dots and stippling but also well perform that special quality of a fountain pen where thinner lines can be created by rotating the pen almost vertically, perpendicular to the paper. A fat and thin pen in one! I often correct with Bic Wite-Out pens on trash paper (never the sketchbook!) and impatiently plow through fresh puddles with my Hero. Hasn't clogged yet. This is the secret! Noodler's Ink has some very special qualities. 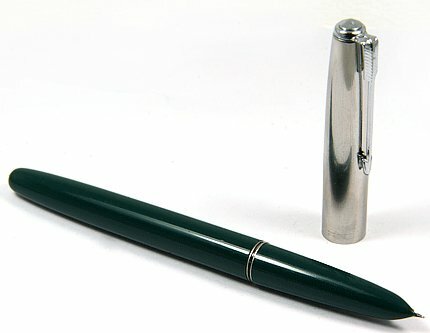 The first is that it is specifically designed for fountain pens. That means it doesn't dry in the pen, so there are no clogs. It also lubricates the parts so ink flows freely. The second quality is that the ink becomes permanent and water proof after touching cellulose (paper). Really waterproof. I use it in water color Moleskine notebooks and literally wash my sketches with water and watercolor paints... zero bleed. It works well on trash paper and is smear proof in seconds. This would be a distinct advantage for a left-hander. 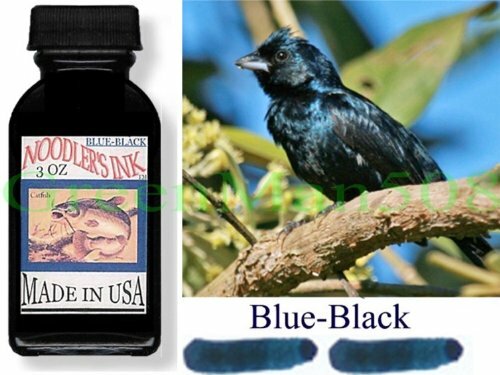 The third quality is Noodler's color selections. Most designers don't need a lot of colors, but they do want good colors. All of Noodler's colors are designer type colors, plenty of subtle shades to choose. I like Blue-Black because it is nearly pure black but has a very faint trace of being non-black so that original signatures and drawings differ from photocopies upon close inspection. I actually think the hint of blue makes the lines look darker beside pure black lines. Although the bottle is $12.50 it will last... decades? I have no idea, I discovered Noodler's maybe four years ago and have barely made a dent in the bottle using it as my primary writing instrument the entire time. Maybe encourage colleagues to buy different colors and share around? Refill at an empty sink with some clear counter space for room to work. The one small risk is dropping the pen with ink, the splatter dots will be everywhere! Fold a fresh paper towel square once and put the ink bottle on it right next to the sink. This can catch drips, although I've honestly never dripped on it. It also provides a little traction so the glass bottle doesn't slide. Have a second paper towel ready to wipe the pen. Unscrew the pen barrel cover and open the ink bottle. Holding the pen by the squeeze button, dip the pen barely into the ink and squeeze the button 6-8 times and release. Turn on the sink water. Carefully move the pen over to dip the nib, pointed down, into the stream for a split second. The goal is to simply wash off the ink on the outside of barrel. Use the paper towel to dry the outside of the pen. Write a line with the nib on the paper towel to quickly draw out any ink at the tip that might be slightly diluted by the bath water. Done! Wash the inside of the pen cap if you want. Make sure to dry it out with a twisted corner of paper towel so any remaining water in the cap doesn't become a soggy inked mess all over the barrel. 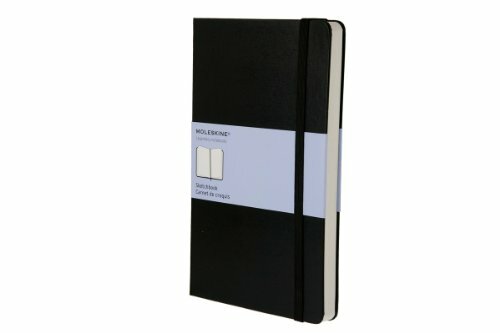 I've not had a single system failure in the four years I've been using Moleskine + Hero + Noodler's. This includes many plane flights, packing in travel bags, dropped pens, dusty conditions, rain, snow, drawing through Wite-Out, etc. Literally all the pens I've used in five years are still functioning, and I worry less about writing instruments than I ever have. The sketchbook allows for Letter sized sketches, is small and portable, allows for quality drawings, and has a lot of nice little refined features. The pen and ink combination is great for spreading lots of ink in with a variety of line qualities, is waterproof, acid-free archival quality, quick drying, and very inexpensive. 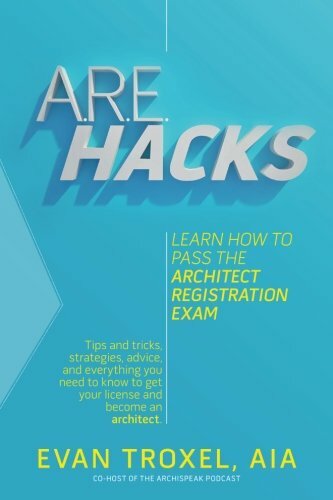 Just like architecture, the tricks are in the details and the specifications. I hope this was useful to someone. Please drop me a line at SteveHallArchitecture if you have any comments.